Is it weird that I photograph other people's dogs for my blog? Sweetest. Dog. Ever! Did I mention he's over 200 pounds?!? We met Chester in the park today. Actually, I saw him all the way across the park. I have this talent for spotting Newfies from miles away. We immediately made a beeline over to pet him. As I was marveling at his fluffiness, I noticed a scar on the top of his nose and asked his owner what had happened. She told me that Chester was 5 years old, and she had owned him for 3 years. She nursed this marvelous creature back to health and the only way you would notice anything was by the scar on his nose. What a story behind that cutie! He's come a really long way from when his owners got him. I love the fluff! 200 pound dogs have a tendency to do exactly as they please. It's a good thing he wants to be gentle. 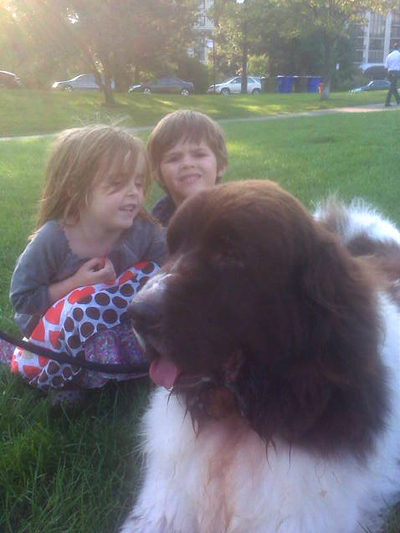 I also have a soft spot for Newfies and Chester. And my newfie has a terrible stubborn streak too. He does totally get away with it because he is so darn cute.